This ranch style home sits on 45 acres in Urbana, MO. It has 5 bedrooms, 3.5 bathrooms at approximately 3099+- sq ft Apx. 1600 sq ft modular home with a 1500 sq ft stick-built add on. This home has been well maintained and has great upgraded details. With hardwood flooring, custom wood-paneled walls, and great outdoor space, this home has that country rustic feel. The front porch provides great patio space, with built in bench seating. The lawn and landscaping are well-kept, and the above-ground pool will remain on the property. In addition to the 5 bedrooms, you will find 2 living spaces, a separate office area, a utility room, and a bonus room. On the main level is the master bedroom with ensuite bathroom, and a guest room. Upstairs are 3 bedrooms and a full bath. There's a 30 ft. X 40 ft. shop building with concrete floors, insulation, and electricity. A separate 30 ft. X 56 ft. outbuilding with electricity and gravel floors sits on the property as well. The land is ready for your horses or cattle. It's made up of 30 open acres, and 15 wooded. Terrain is gently rolling, and land has fencing and cross-fencing. The current owners have run 15-20 head of cattle and have produced 60-65 round bales from the land, unfertilized. You can fish the large half acre pond, and it provides a great water source for animals. The neighboring property has a spring that feeds this pond, so it stays year round. 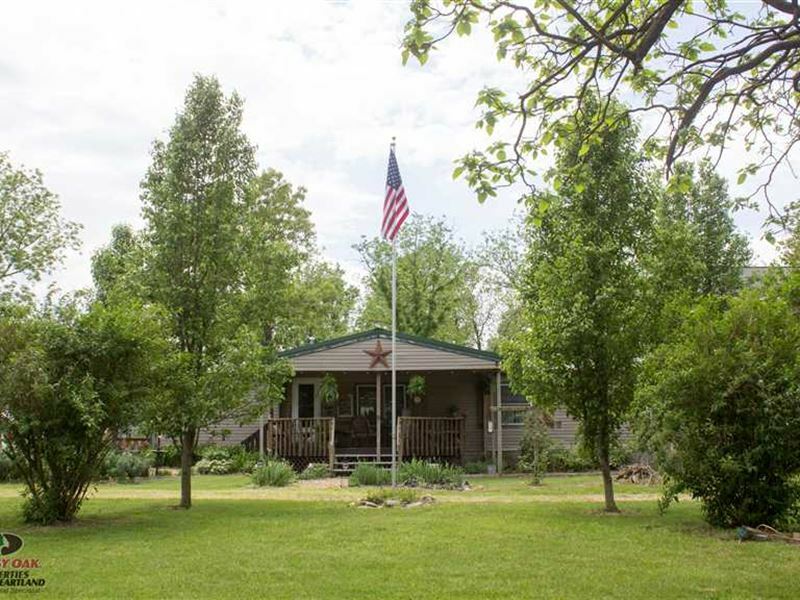 This property provides great recreational use, with the ability to ride your horses in the field, hunt whitetail and turkey, or fish in the pond. A small patch of timber provides a great area for a turkey blind on the southwest corner of the property, where they roost nearby and fly down into the open field. Taxes are apx. yearly. Electric bills apx. per month. Skyline School District. Call or text at for your viewing.